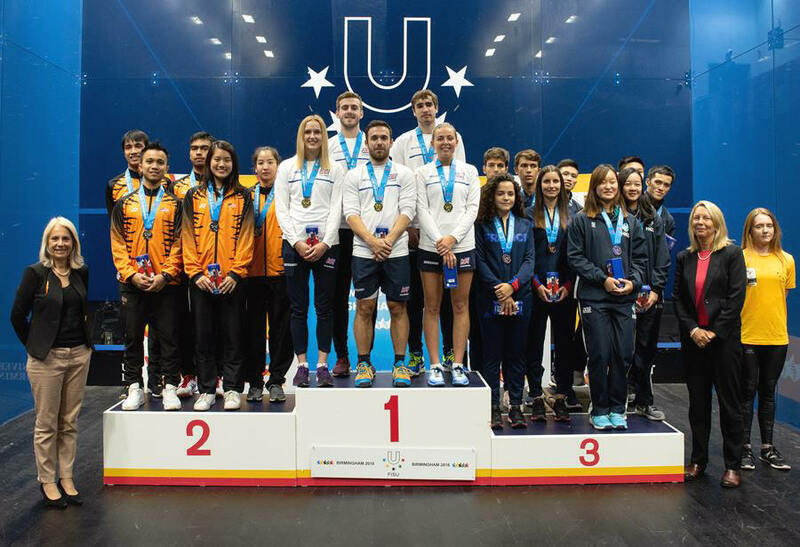 The curtain came down on the biggest World University Squash Championship to date with the completion by the host nation of a maximum triple gold-medal haul. Victory for Great Britain over defending champions Malaysia in the Final of the team event at the University of Birmingham came three days after the award of the Championship’s individual titles to home players Josh Masters and Lily Taylor. And by way of fittingly neat symmetry, the newly-crowned men’s and women’s champions - who are also fellow students at the University of the West of England - gained the two necessary match-wins to ensure gold for their team yesterday afternoon. The Malaysian side, who had also won the event on home ground, in Kuala Lumpur, two years previously, featured three individual bronze medallists in its Final team- although Mohd Syafiq Kamal and Aika Azman had been beaten in their respective men’s and women’s Semi-Finals by Masters and Taylor. Now, as fate would have it, they were paired against them once more, and, happily for Team GB, very recent history was to repeat itself. An aggressive start by the 23-year-old Masters saw him race into an early 9-2 lead in the opening game - and while Kamal, one year his junior, closed the gap slightly by gaining a further three points, the men’s champion duly picked up the two he required to draw first blood after ten minutes had been played. A second game of quicker pace and tougher rallies was notably more even - although Masters remained calm and in control, before edging ahead when it mattered. And the third very much followed the pattern of the first, with Masters storming in front and rarely having to look back as he triumphed, as he had done in their weekend meeting, with a straight-games victory (11-5, 11-8, 11-6) - achieved in just over half an hour. The individual Semi-Final between Taylor and Azman, both 21, had, in contrast with that of their male compatriots, gone the full five-game distance at the weekend. But Taylor replicated the relative ease of her victory in the first game from Saturday by going one-up with only six minutes on the clock. The games then became tighter, as Taylor proceeded to double her advantage by claiming the second, before Azman won the third to halve the arrears and take to the court with a visible spring in her step for the fourth. But it was Taylor, who, following a long rally of quality on match-point, prevailed to triumph 3-1 (11-6, 11-8, 9-11, 11-8) after 36 minutes - and, with no need for the tie’s final match that would have put Team GB’s Semi-Final hero Adam Auckland up against Addeen Idrakie, the women’s champion’s work was done for her side. The hosts had struck gold not twice, but thrice! A delighted Great Britain coach Josh Taylor said: “I’m immensely proud of the team this week, there were great performances from everyone. It was truly a team effort in the team event, having rotated the whole squad and claimed gold. Team Malaysia were generous in defeat, commenting: “We expected it to be hard for us, as they (Masters and Taylor) had both won their matches against us in the individual champs. We just tried to play our best squash, but they played much better than us today - big credit to them! The next FISU 2020 World University Squash Championship will be held in Shanghai. 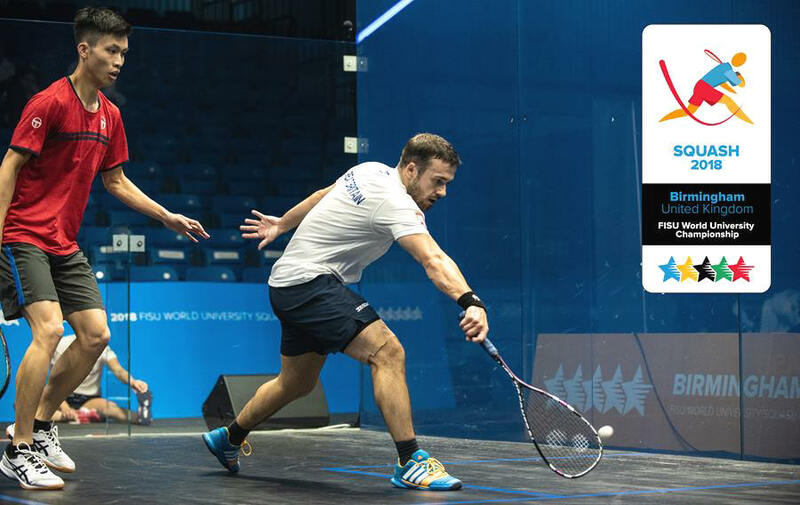 The sixth and penultimate day of the FISU 2018 World University Squash Championship saw the remaining nations in contention for the team event complete the competition’s group stage, followed by a best-of-three Semi-Finals. Today’s Final at the University of Birmingham promises to be an intriguing contest - pitting the first seeds and reigning champions Malaysia against the hosting United Kingdom, which now has an opportunity to achieve a clean sweep in the Championship, following the award of the individual titles on Sunday to home players Joshua Masters and Lily Taylor. All of the deciding group fixtures stuck to the seeding script - with Malaysia pipping Switzerland (seeded 8) by two points to one in Pool A; Hong Kong (2) and Great Britain (3) winning in straight matches against Australia (7) and South Africa (6) respectively to top Pools B and C; and France (4) edging out the Czech Republic (5) by the odd point in three to qualify from Group D.
So to the afternoon, which threw up an opening Semi Final between the top-seeded title-holders, Malaysia, and France, as well as an opportunity for two of the Malaysians’ individual Semi-Finalists - who had been beaten in the last four of their respective competitions by Masters and Taylor - to go one better as part of a collective effort. Men’s third seed Mohd Syafiq Kamal took to the court reeling from a morning defeat against the leading Swiss competitor Robin Gadola, but made no mistake in a tidy straight-games triumph (11-8, 11-6, 11-5) over Auguste Dussourd, whose recent involvement in the qualifiers for the 2018 Open International de Squash de Nantes had prevented him from featuring at Birmingham earlier. The women’s second-ranked candidate Aika Azman got off to a more stuttering start against France’s Julia Le Coq, who raced to a 9-2 lead in the opening game that she eventually sneaked by a three-point margin - despite the Malaysian’s spirited comeback. But, as the pace of the contest intensified, Azman held her nerve to edge close second and third games, before coming from behind during the fourth to prevail 3-1 (8-11, 13-11, 11-8, 11-9) and - following a mutual decision not to play the tie’s final match - propel the holders through to the Final. The second Semi-Final between Team GB and Hong Kong featured in its entirety pairings that had already come up against each other in the men’s or women’s events. An exact repeat of those matches would have resulted in a 2-1 overall victory for the lower-seeded British. And while the teams did, in fact, end up producing that very outcome, their individual winners and losers differed in two cases out of the three! Masters and top men’s seed Yip Tsz Fung re-enacted their Final from two days previously - although, on this occasion, the spoils went to Yip over five typically fast-paced games (11-8, 6-11, 8-11, 11-8, 11-6). And after Grace Gear levelled matters by winning 3-1 (11-5, 6-11, 11-4, 12-10) against Ho Ka Wing - the opponent that she had successfully overhauled in the women’s fifth-sixth place play-off - Adam Auckland upset the recent form-book in Britain’s favour, as well as avenging his Third Round defeat of the previous week, after seeing off Wong Chi Him in straight games. This was, for impressive added measure, Auckland’s national debut in a team event - and, with it having seen him get GB over the line and through to the Final, one that will live forever in the memory. 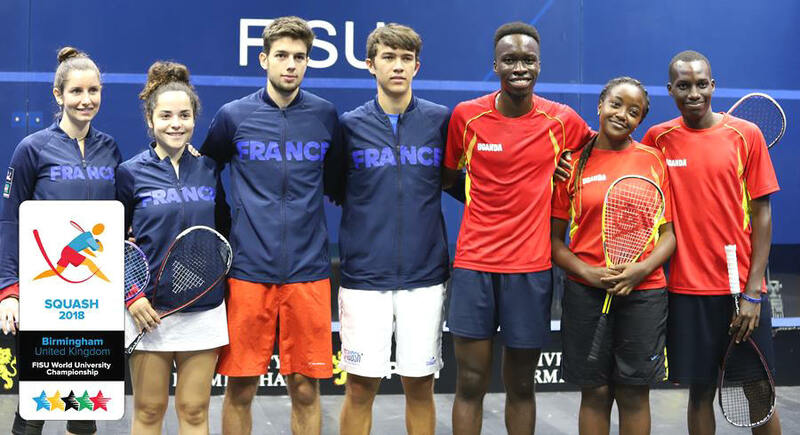 Following the final of the men’s and women’s individual competitions, the focus of the FISU 2018 World University Squash Championship switched on its fifth day to the initial group fixtures of the team event. Thirteen nations in total are competing for the 2018 team title at the University of Birmingham - with each contest being resolved in favour of the side that secures the best of three match-victories. There were no shocks to report from the opening day’s play - although neither, just yet, are any teams guaranteed progression to the Semi-Final stage as outright winners within the four groups. In Pool A, top seeds and reigning champions Malaysia will be intent on going one better than they did in the individual competitions - which, remarkably, saw four of their players reach, but fail to win any of the men’s and women’s Semi-Finals. Two of those last-four losers set the tone for their team’s opener against Canada (seeded 9), as men’s fourth seed Addeen Idrakie and the women’s sixth-ranked competitor Zoe Foo began with straight-game defeats of David Mill and Chloe Chemtob respectively, before Sanjay Singh also saw off Ravi Seth by the same margin to secure an overall victory and a maximum three points. Pool B is even tighter going into the final match, as Hong Kong (2) and Australia (7) sit level on two points apiece, following their respective victories over New Zealand, and will now take on each other for a place in the final four. The clash of the Antipodean countries yesterday morning was an especially entertaining advertisement for team squash - with all five matches between Australia and New Zealand being needed over the course of two and a half hours, before the former eventually prevailed. In Pool C, newly-crowned men’s champion Josh Masters showed himself to be fresh in every sense from his Sunday afternoon Final exertions, as he got the United Kingdom (3) off the mark against Austria (11) with a straight-games triumph over Simon Draxler. Owain Taylor also beat Michael Haunschmid 3-1, together with a walkover-victory in the first women’s tie. But this win did no more than emulate the feat of fellow-group members South Africa (6), who had already set the bar by dispatching the Austrians in the morning - and against whom the UK must today prevail in order to advance further. Finally, the outcome of Pool D - containing one more team than the other three groups - will come down to a straight fight between the closely-matched French (4) and Czech Republic (5) sides, after both enjoyed victories yesterday against the two lowest-ranked teams from China (12) and Uganda (13). 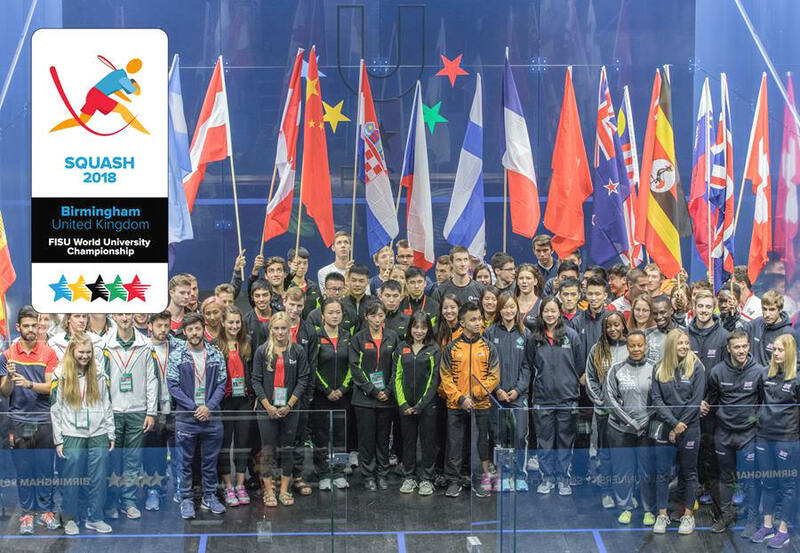 Hosted in the arena of the University of Birmingham Sport & Fitness club, athletes and officials from 19 nations were welcomed into the all-glass show court yesterday evening for the Opening Ceremony of the FISU 2018 World University Squash Championship. The crowd, including athletes, officials, referees, volunteers and University of Birmingham staff were played in by the University of Birmingham Brass Quintet who did a beautiful rendition of the United Kingdom's national anthem. A fantastic line-up of guest speakers took to the stage to welcome the event back to the UK, 20 years after the Championship last came to Cardiff in 1998. Chris Ryder, Championship Director and 2006 World University Squash Championship winner, started proceedings by welcoming the athletes to the arena, commenting that 'the competition is quite literally nothing without you'. Dr Ed Smith CBE, Pro-Chancellor of the University of Birmingham, took to the stage to extend a warm welcome to all of the guests on behalf of the University - mentioning the 50 volunteers who will be involved in the event, thanking FISU for putting faith in the University to host the event, and passionately showcasing the importance of squash at the University of Birmingham. The Championship was then officially opened by British Universities and Colleges Sport Board member, Ben Moorhead. The fabulous FISU anthem was played live by the Brass Quintet, and on behalf of all the student athletes, the Athlete's Oath was taken by Lily Taylor, who will be representing Team GB throughout the Championship. Marko Podgorsek of Slovenia took the Oath of Referees on behalf of the event officials. The Opening Ceremony kick-started the Championship with a burst of positive energy and excitement for the opportunities which lay ahead. Tickets for the individual and team semi-finals and finals are available to buy online, book the edge of your seat now and keep an eye on the results over the next few days to see which athletes make it through to the final stages. We can't wait to see all your pictures, posts and videos during the event - be sure to tag @WUCSquash2018 on Twitter, Facebook and Instagram and use the hashtag #WUCSquash2018 so we can see all of your posts!